1. Soak omum in warm water for an hour grind it along with red chilli with water. 3. In a small bowl mix together all the ingredients and knead the dough with omum water to form a smooth batter. 5. Heat oil in a kadai on a medium flame. Fill the sev press with batter and add small portions of dough and squeeze it in small portions into the hot oil. 6. Cook both sides till the sound subsides. Drain well and repeat the procedure with the remaining batter. 7. Keep the flame high while pressing the sev and reduce the flame to medium or low while cooking. This will ensure a golden colour to your mixture. 8. Drain the excess oil. Server them with hot chai or coffee!! 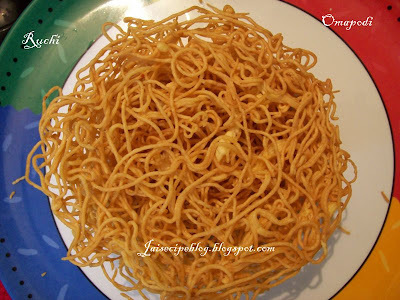 My all time favourite...it has been long i prepared, Crispy omapodi looks superb! FoodShoutOut.com is a place for people to discover and share great indian recipes from anywhere on the web. From the biggest online destinations to the most obscure blog, FoodShoutOut.com surfaces the best stuff as voted on by users. I am with you on this, I do love omapodi, esp the home made version. Perfect color. Wow looks perfect looking...so tempting ..
Yum! I made this for first time for Pongal this year. It's so savory. looks so crispy nd yum,.. 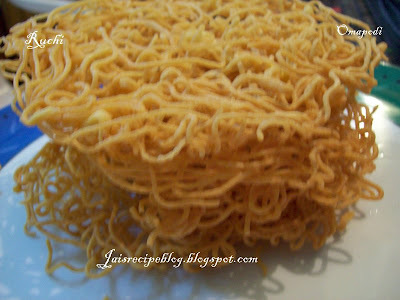 Delicious omapodi recipe... makes me crave for some..
Looks just perfect, reminds me I haven't had this in a long while! Omapodi looks crispy and I am for sure will never say no to it!! !